The event’s theme is “Leading Cultural and Professional Unity for Peace.” The theme is what dictates the visual design and we have gathered and scanned several photos that express this idea. One is of University of Southern Philippines (USP) President Ronald R. Duterte receiving an award from Soko Gakai University in Japan (center, photo with red area). Another is of Gloria Macapagal-Arroyo taking oath with Honorable Hilario Davide, Jr. as she became the second female president of the Philippines after the Edsa Dos People Power revolution. The later will receive the Rizal Peace Award in August a year later from USP. Other pictures depict children of other nations. All these persons are the leaders of cultural and professional unity for peace. 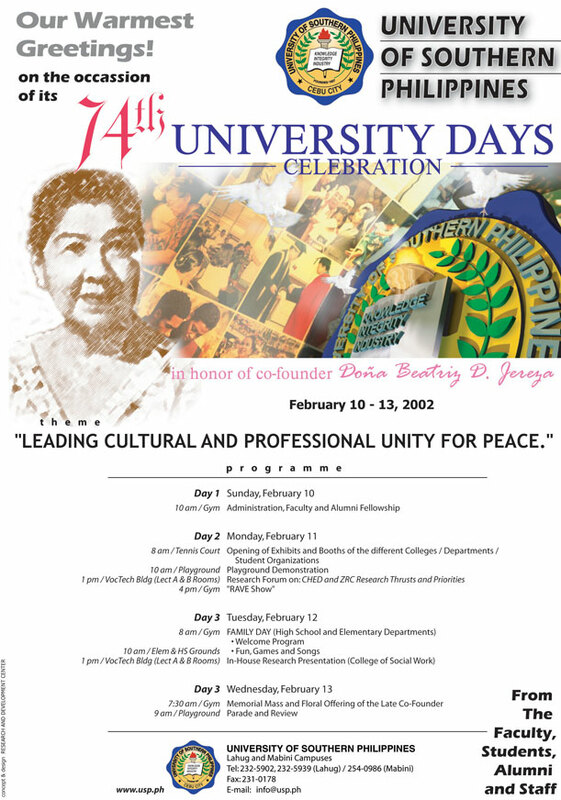 The whole page advertisement appeared on Sun-Star Daily on February 10, 2002.